Description: Who was Tertullian, and what can we know about him? This work explores his social identities, focusing on his North African milieu. Theories from the discipline of social/cultural anthropology, including kinship, class and ethnicity, are accommodated and applied to selections of Tertullian�s writings. In light of postcolonial concerns, this study utilizes the categories of Roman colonizers, indigenous Africans and new elites. The third category, new elites, is actually intended to destabilize the other two, denying any �essential� Roman or African identity. Thereafter, samples from Tertullian�s writings serve to illustrate comparisons of his own identities and the identities of his rhetorical opponents. The overall study finds Tertullian�s identities to be manifold, complex and discursive. Additionally, his writings are understood to reflect antagonism toward Romans, including Christian Romans (which is significant for his so-called Montanism), and Romanized Africans. While Tertullian accommodates much from Graeco-Roman literature, laws and customs, he nevertheless retains a strongly stated non-Roman-ness and an African-ity, which is highlighted in the present monograph. 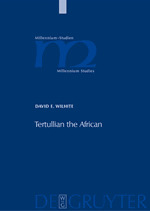 Citation: Ilaria L. E. Ramelli, review of David Wilhite, Tertullian the African: An Anthropological Reading of Tertullian's Context and Identities, Review of Biblical Literature [http://www.bookreviews.org] (2009).